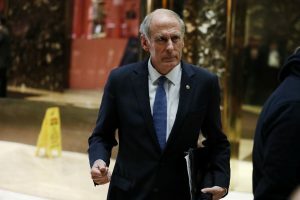 WASHINGTON — President-elect Donald Trump has selected former Indiana Sen. Dan Coats to lead the Office of the Director of National Intelligence, a role that would thrust him into the center of the intelligence community Trump has publicly challenged, a person with knowledge of the decision said Thursday. Intelligence agencies have concluded that there is no question that Russia was behind hacking of political computer systems — something they say could only have occurred with the approval of top Kremlin officials. That conclusion is detailed in the classified report Obama ordered up on Russia and other foreign influence in U.S. elections dating back to 2008. READ MORE: Trump’s cabinet is mostly white and male. What will that mean for policy?